These are the 5 core skills that make up the Australian Core Skills Framework (ACSF). These skills have been identified as the basic skills that a person needs in the community, classroom and workplace. By taking this test, we will be better prepared to help you should the test determine any LLN issues. 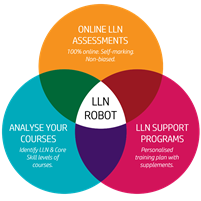 Please contact our office, after enrolling in one of our courses, to get the link to our online LLN Test.